Cast: Johnny Depp, Helena Bonham-Carter, Emily Watson, Richard E Grant, Paul Whitehouse, Tracey Ullman, Joanna Lumley, Albert Finney, Christopher Lee, Michael Gough, Jane Horrocks, Deep Roy, Danny Elfman. Directed by Tim Burton and Mike Johnson. Story: An engaged puppet accidentally marries a corpse. As you do. 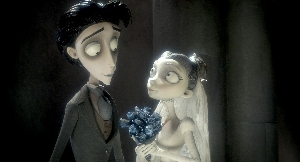 Corpse Bride is the latest animation to hit the silver screens. Painstakingly made and beautifully presented, it's a masterpiece of animation - but it's not funny enough to take the prize. 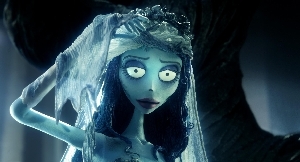 Corpse Bride, or Tim Burton's Corpse Bride, to give it its full title, is made with stop-frame animation. That is, the characters, puppets in this case, are moved a fraction, photographed, then moved again. I'm a little suspicious of this claim. Parts do look like they're done this way, but some of the movement is just ... well, too good. I find it very hard to believe that they didn't do the tricky bits with CGI. No matter though, whichever way you look at it, it's fabulous animation - the characters are gorgeous to look at. There is one problem though - I kept thinking that the voices didn't match the characters and couldn't think why. Eventually I twigged that it was because the mouths don't shrink when they talk - so when the bride's voice says, "I do," her mouth says, "I dah." It sounds like a minor thing, but it really distracts at times and seems bizarre when so much effort has been put into the rest of the production. Perhaps it's a trick to make us believe it's done using puppets after all! The voice acting is excellent by the main players, with Emily Watson giving a particularly special earthly bride and Helena Bonham-Carter as the dead one, showing she didn't just get the part by giving the director a son. Michael Gough, best known as Alfred the butler from the Michael Keaton Batmans is similarly wonderful as the wise old skeleton. Danny Elfman, responsible for the music in nearly all of Tim Burton's movies, visits the other side and has a go at acting himself, being surprisingly good as the musical Bonejangles. Maybe this distracted him, because the songs seem to stir things up a bit rather than fitting in - but then I've never been a fan of songs in movies so that might just be me! Standing alone, Corpse Bride is fantastic - but unfortunately it has to compare with stunningly good movies such as Madagascar and Wallace and Gromit and it never stands a chance against them. It's the facial expressions - puppets just can't contort their faces enough and so they can't generate the depth of character that a plasticine model or a drawing can. Considering the limitations of puppets, they've done a spectacular job to make it as good as it is. Corpse Bride is a joy to watch and the kids will love it - but ultimately it lacks a little character compared to the genre leaders, which must surely be a consequence of using puppets. Definitely worth your money to see it though - it's hard to be disappointed with quality such as this. To enjoy this film you should: not expect it to be another Wallace and Gromit. Corpse Bride is released in the UK on 21st October.